From left: Father Taniela Koroi, Vilimoni and mum Seruwaia. The healing water of Natadradave is the reason why Vilimoni Koroi is able to make the New Zealand 7s team for the Wellington 7s team this weekend. 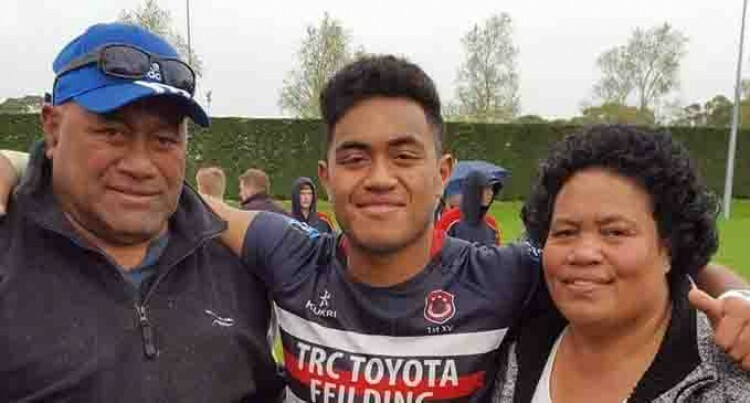 His dad Taniela told SUNsports yesterday that his son injured his knee while playing for the NZ Secondary School XVs in a warm-up clash with NZ Barbarians. This saw him withdrew from the NZ Under-20 side. “He didn’t play in that tournament due to his knee injury, so we came back home and told him to fly over to Fiji to go to Natadradave,” Taniela said. “I called up my daughter to take him there which they did and now he has been healed. He was there for only one week and now his knee looks like he hadn’t got any injury. Taniela said they are proud of his son’s success. The 18-year-old was born and bred in Wanganui and is the fourth youngest of eight children. He hails from Maloku, Moala in Lau, and has maternal links to Nukuloa in Gau but his father was born and bred in Naiseuseu in Beqa where his grandmother is from. “This is something my wife and I will put all our support on because this is his dream and I am happy because he took heed of my advice which was to become something in the future.